Are you preparing to take a major step in growing your business by signing your first commercial lease? Arizona has a fast-growing entrepreneur community of new business owners, many of whom are signing their first AZ commercial lease. Several testimonies from small business owners have revealed that optimal professional relationships were maintained with their lessors by negotiating transparent, clear-cut, and mutually-beneficial tenant contracts. 1. Can my business’s budget and infrastructure accommodate the space for the duration of the lease period? Be conscientious of your business’s financial circumstances, growth projections, and goals. Once you move in, commercial space becomes an integral part of your business. It shapes your company’s cost structure, becomes the hub for its key activities, and likely constitutes and houses one or more of your business’s key resources. 2. Will my business or the lessor be responsible for paying tax levies or surcharges on the property? Some contracts may require you cover charges imposed on the lessor by outside institutions. For example, if you are not willing to pay a portion of the lessor’s state-imposed property tax as a renter, it is your responsibility to make sure your contract does not require you to foot the bill. 3. Are there any service or space fees that my business will be responsible for paying? In some real estate contracts, the lessor may charge the tenant for space or services the tenant has no intention of using. In addition, some AZ commercial lease arrangements may ask the tenant to pay a fee for use of common space in the facility. If these are spaces you do not reasonably foresee utilizing, it may be wise to ask for an exemption to that charge. Finally, always know how employee parking and utilities costs will be handled before moving forward with any lease agreement. 4. Is the lessor in a solid financial position? An unstable lessor in a compromised financial position is a heavy risk that may become a bigger pain to your business than the lessor’s space is an asset. A landlord in need of capital to keep his/her practice afloat is more likely to raise rent, impose hidden fees, fail to follow through on property maintenance obligations, and risk foreclosure. Look for sustainability and integrity in your landlord, and your business will find the right home base for its operations. 5. When in doubt, ask a professional real estate lawyer. It’s always good to have a trained eye look over your deal to ensure everyone’s interests are protected under the commercial lease. Arizona is home to many real estate attorneys who can help you navigate the process. Be sure to check out our Resources page to help make the leasing process from Camroad Properties as productive and easy as possible. Options for an AZ commercial lease can be as wide (or narrow) as the renter’s knowledge of real estate, brokerage, and legal contracts. Before the property owner’s “FOR RENT” sign goes down, and your business’ logo affixes itself to the face of an office space, you surely encounter some esoteric legal jargon. We’ll address some critical terms that could mean the difference between an exciting decision and a stressful process of signing a commercial lease. Arizona has a wealth of great commercial real estate for lease, and it’s important to know some of the basic vocabulary. 1. Possession Date: the date upon which the tenant takes, or is authorized to take, legal possession of a leased premises. This date is put in place because commercial lease contracts often require the property owner to officially give full legal possession of the leased space to the renter. Often portions of large properties will be leased out in increments while other parts of the property are still under construction. 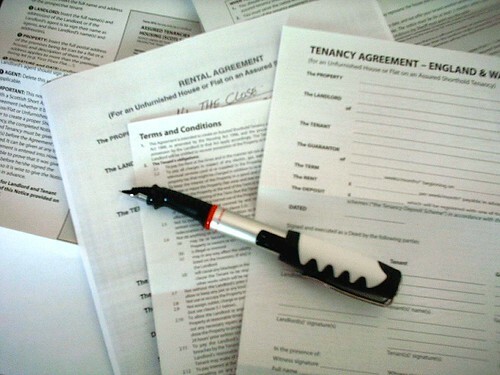 If for example, you sign a lease and the possession date falls on the first of January, it means all utilities and features directly part of the space you’re renting are to be completed and/or installed by that date, even though your expected move-in date might not be until the second of January, or even the second of February. 2. Rent Commencement Date: the date set forth for rent to be charged in accordance with the terms of the commercial lease. Arizona lease contracts may or may not begin charging the renter on the possession date, move-in date, or any other date for that matter—it all depends on the specific contractual agreement established between the property owner and renter. Depending on how you and the property owner negotiated the rent agreement, your first rent payment may be exactly 30-days following the possession date, the day you move in the space, or some time thereafter. 3. Date of Occupancy:the date that a tenant may occupy, or commence operations, in a leased space. The day you own a space, the day you begin paying for that space, and the day you actually move in can all be different. The date of occupany explicitly denotes the date at which the renter may begin occupying the space. The date of occupancy is the day you can move your team, equipment, products, and services into the walls of the space acquired under your AZ commercial lease. For you, it is the day your business gets to begin making an impact in an entirely new environment! Now that you’ve brushed up on your real estate jargon, be sure to check out the Camroad Properties online gallery to see if any of our AZ office spaces for lease are the right fit for your business.